Anyone looking for the best fish finder for an inflatable boat has probably gotten frustrated at some point or another during his or her search since most fish finders won’t work well with an inflatable boat. This is because these fish finders require an entirely different mounting system as well as other considerations to make sure that you have the best possible experience when you are out on the water. Rather than giving up on your dream of being able to catch prime fish from your inflatable boat, when you invest in a quality fish finder, you’ll be able to bring in fish that rival ones caught off of larger bass boats. If you enjoy fishing in an inflatable boat and want to be able to get the most out of your time spent on the water, then you will need to invest in a fish finder that will meet your needs. You can do this by finding one that can be strapped on to your inflatable boat while still providing you all of the information and feedback that you need to catch fish. The Humminbird 410060-1 Fishin’ Buddy MAX DI fish finder is not only ideal for use on an inflatable boat but has other methods also, making it an all-around excellent choice for many applications. Telescopic pole 24" - 40"
What Are the Important Considerations When Buying This Product? The mounting is essential when you are going to be using a fish finder on your inflatable boat, as you won’t be able to screw it into the console the way you can in a traditional boat. There are a few ways to mount a fish finder on an inflatable boat. One is by using incredibly strong suction cups, but the more popular option is by using a robust strap. The power source for your fish finder is also something that you need to consider. Usually, fish finders will use a 12V marine battery, but you may need to get creative in an inflatable boat. Looking for a fish finder that uses AA batteries will allow you the portability that you need. Finally, you generally have to mount your transducer when using other fish finders, but ones for inflatable boats will operate a little differently. These fish finders, and this one from Humminbird in particular work with a telescoping pole that can be lowered deep into the water for you to be able to see what’s going on underneath you. Unlike traditional fishfinders where you will mount the transducer inside the hull or through a pipe, you will need a fish finder with a transducer that doesn’t have to be permanently installed on your boat. The Humminbird 410060-1 is ideal for use in an inflatable boat because the strap makes it incredibly easy to adjust to the size of the boat, strap it on firmly, and then remove it when you are finished fishing. 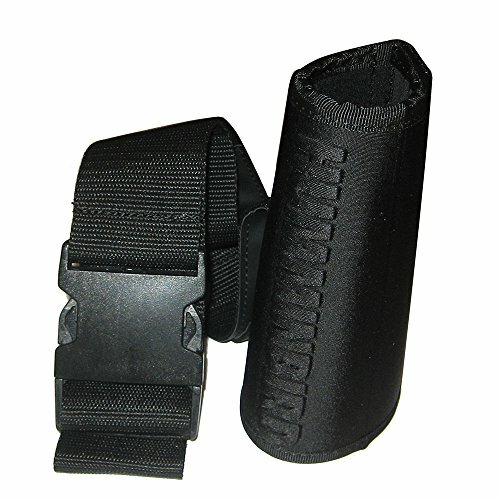 Instead of trying to mount the fishfinder in another way, this strap is stable and reliable, and you won’t have to worry about losing your unit while on the water. Additionally, because it is powered with AA batteries, this lightweight fish finder is easy to take with you without having to bring a larger battery and wires to connect it. The telescoping pole extends up to 40 feet, which will allow you to see to a depth of 600 feet with the dual frequency and down imaging sonar. While this is not as powerful as traditional fish finders, for a portable unit that is designed for inflatable boats, you can’t beat this power. Finally, when you’re not in the mood to go out on your boat but still want to fish, you can quickly clamp this fish finder to a dock and see what’s going on around you. This makes it incredibly versatile and useful for days where you don’t have the energy to take out the boat. You can quickly reposition the head of the strap so that you can turn it from vertical to horizontal, making it easy to strap it in different positions on your inflatable boat without compromising the reliability or durability of the clamp. It’s incredibly easy to use this fish finder on an inflatable boat without worrying about how you are going to connect it. The screen is lightweight enough so that the fish finder won’t lean to one side or the other once you have clamped it in position. Additionally, the screen is just large enough to see easily from anywhere in the boat without it being overkill. 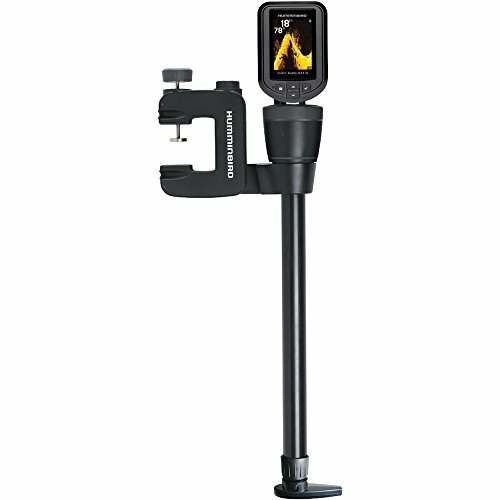 If you want to fish in shallower water, then you are going to have a lot of problems with this fish finder as it has difficulty reading depths under 15 feet. It’s excellent for deeper water but can cause problems when you move to shallow areas. Going too quickly in your boat will cause the unit to lag behind you and pop up and out of the water. It’s best to use this fish finder when you are stationary or traveling at a deficient speed, but this can be frustrating when you want to track fish through the water. If you like to fish from an inflatable boat, then you already are aware that there are specific problems you will run into when choosing a fish finder that will meet your needs. For this reason, buying a unit that is made specially to work with an inflatable boat is essential. The Humminbird 410060-1 Fishin’ Buddy MAX DI is the best fish finder for an inflatable boat and makes it very easy to take out your favorite boat while still using a quality fish finder. It’s effortless to use and intuitive, and since it is powerful to scan down into deep water, you can easily track fish without any problems. Additionally, when you want to move to another boat or sit stationary on the dock for a while, there aren’t any difficulties detaching this fish finder from your inflatable boat and taking it with you to a new location. By running on AA batteries, this fish finder makes it easy to keep spare batteries on hand so you can replace them when they die. The 3.5-inch display has enough room to show you everything you want to see easily and will also display in enough detail that you’re not left wondering what is on the screen.